Ahh, Rhapsody: the band who penned many an epic saga, but then ended up becoming a real-life saga themselves – though many would regard the whole episode as a farce. Guitarist Luca Turilli had his own project called Luca Turilli happening alongside Rhapsody; then Rhapsody had some legal issues which resulted in changing their name to Rhapsody Of Fire; then Luca Turilli and keyboardist Alex Staropoli parted ways as a songwriting duo – Alex proceeding with Rhapsody Of Fire, and Luca forming his own wildly successful spin-off entitled… Luca Turilli’s Rhapsody (with bassist extraordinaire Patrice Guers). Then, horror of horrors, much-beloved vocalist Fabio Lione left Rhapsody Of Fire closely followed by longtime drummer Alex Holzwarth. It’s all enough to rival Tolkien himself in terms of sub-plots! 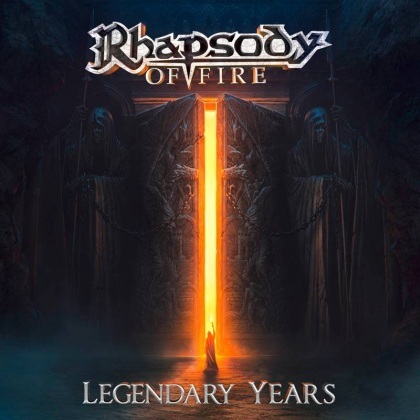 In most fans’ eyes (including myself) Rhapsody Of Fire are now dead – even if last year’s Into The Legend was pretty good. But the lifeless corpse of the greatest symphonic power metal band ever twitches as Staropoli hires an almost entirely new cast of musicians to re-record some of the band’s legendary numbers from the glory years – suitably titled Legendary Years. And, as expected, the question on everyone’s lips is: why? It would be superfluous to go into detail about the songwriting, seeing as they’re all tried and tested classics of the genre, so the main point of focus will inevitably be the track selection. There are some obvious choices, without which many fans would be angered, but I have my criticisms. Naturally, we have “Holy Thunderforce”, “Dawn Of Victory” and the unavoidable “Emerald Sword” – but no “Power Of The Dragonflame”? And don’t get me started on there being a total absence of anything from Symphony Of Enchanted Lands – Part II or Triumph Or Agony. Perhaps the legal complications surrounding that era made it undoable, but I was really looking forward to hearing a beefed-up version of “Unholy Warcry”. However, it’s heartwarming to see some overlooked gems like “When Demons Awake” receive some love. Or is ‘love’ too strong a term? So how does Legendary Years sound? Well, it’s a different production quality of course. It doesn’t sound as open and grand as the original album series, but it’s at least squeaky clean and polished, if a little lifeless. I will say one thing: there are some minor details that the new production has brought forward, such as the flute underneath the guitar solo in “Dawn Of Victory” which I had never previously noticed. This kind of instrument-spotting quickly becomes the main activity throughout this release, seeing as literally nothing else, apart from the production, has changed. That’s right – the songs are all exactly the same arrangement as the originals. Avoiding the poisoned verbal arrows of die-hard fans who can’t accept change can be a wise move, but if you want to push the band forward with fresh faces, some gentle re-workings of the old material would be appreciated. My one serious musical complaint would be that Staropoli’s recent fondness of heavy guitars has begun to outshine the all-important symphonic element. That horn counter-melody at the end of “Knightrider Of Doom”? Inaudible. The pre-verse string section at the start of “Dawn Of Victory”? Eclipsed. So what could be Staropoli’s motive behind this move? Cash grabbing? Proving the new line-up can keep up with the demanding classic material? Or maybe just plain and simple nostalgia? I wouldn’t even recommend this to fresh ears; if you want a decent overlook, check out Tales From The Emerald Sword Saga, which should always be regarded as the definitive ‘best of’. This drastically low score can be put down to a case of pointlessness, rather than a lack of compositional quality. We all know how good these songs are – so let’s just hear them as they were intended! I remain cautiously optimistic for the next batch of new material from the refreshed (Alex Staropoli’s) Rhapsody (Of Fire) – but until then, let’s just forget this little charade ever happened. Legendary huh? What now…? This entry was posted in Bands, Power Metal, Reviews and tagged afm, afm records, Alex Staropoli, Fabio Lione, Luca Turilli, Luca Turilli's Rhapsody, power metal, re-recording, re-recordings, rhapsody, Rhapsody Of Fire, Symphonic Power Metal, Tales From The Emerald Sword Saga.